Head over to SoundCloud, and you'll find 10 audio files that span three centuries. It's a fairly random collection, we'll admit. But two recordings from the 19th century immediately stand out. First we have Alfred Lord Tennyson (1809 – 1892), Poet Laureate of the United Kingdom during Queen Victoria's reign, reading "The Charge of the Light Brigade" on the wax cylinder in 1890. And then we get to hear echoes of the voice of William Gladstone, the four-time Prime Minister of Great Britain (1809 - 1898). 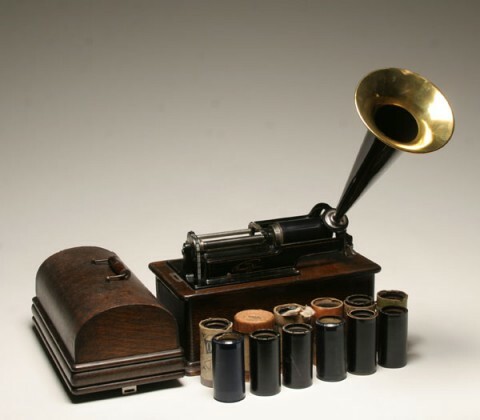 Here, Gladstone's voice was recorded by Thomas Edison's phonograph cylinder (1888), the same device that lets us listen to Tchaikovsky (The Nutcracker, the 1812 Overture, etc.) chatting with his friends. Some have doubted the authenticity of the Gladstone recording, but it still remains generally accepted. For more on recordings from the 19th century, we'd recommend spending some time with a five-part BBC series called Gramophones & Grooves. It takes you into the early recording industry and lets you hear countless other voices.